A severe snowstorm hit most parts of Ireland on Wednesday, leaving local resident's lives and businesses in the country seriously disrupted, reported local media. Latest reports coming in said that over 400 flights were cancelled at the airport of the country's capital Dublin, leaving hundreds of local and foreign passengers stranded at the nation's largest airport while delays and cancellations of flights were also reported in some other parts of Ireland. Dublin and its surrounding areas in the country's eastern coastal region, together with the southeastern part of Ireland, were the most hit areas in the snowstorm with some areas having reportedly received over 10-centimeter-deep snow on the ground in an overnight snowfall. 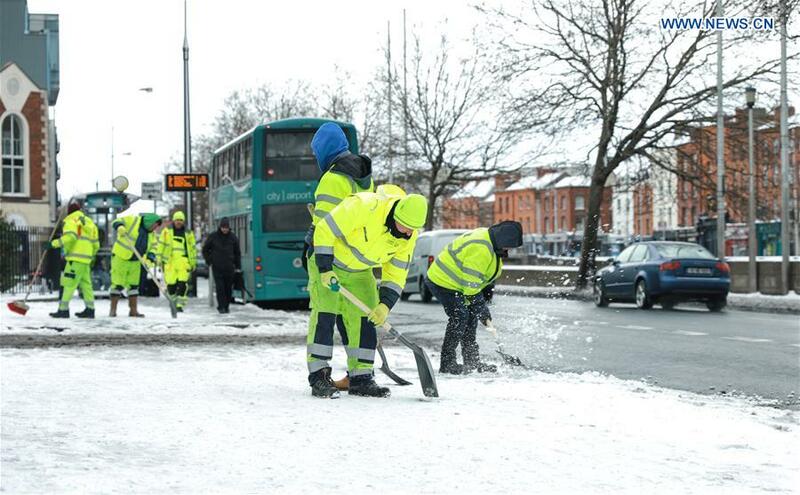 Heavy snow has also resulted in serious delays in the bus, tram and train services in many areas, especially the most densely populated city of Dublin whose one-million-plus population accounts for nearly one-fourth of the country's total. Closure of roads, traffic jams and accidents were reported in many snowstorm-hit areas, but no fatal traffic accidents have been reported in the snowstorm. Nearly all the schools were closed in Dublin and many businesses were closed or forced to close earlier than usual hours in the city.